Last week I tested the new Canon G10. Until a wider array of small, high quality cameras will be available next year, I thought this one might be a good compromise. Well, the camera went right back to the store. In the great tradition of first rate Canon quality control, the upper left corner of the files was distinctly blurry, starting at mid zoom and getting worse towards the long end. This is a pity, because otherwise the camera seemed great. I’ve never seen a digicam that comes close in operation to a DSLR. This one kind of does – you have access to every important adjustment parameter without the need to scroll through menus. Build quality seemed first rate, apart from a somewhat fragile feeling lens. I’ve gone through this with Canon (and others) before, and will wait for the second batch. Someone once explained to me that later batches of this kind of mass produced products usually get some tweaking – apparently it is very difficult to get the manufacturing process right from the start. But I have doubts. I’ve looked at some full resolution G10 files on flickr, and a number of images displayed similar issues (although not as bad as the ones from my sample). The high pixel count of the small sensor demands a very high precision lens, and the slightest sample variation will show – the files I saw all looked somewhat strained. I suspect that with these camera specs, and at this price point, you have to be kind of lucky (or very persistent) to get a good sample. 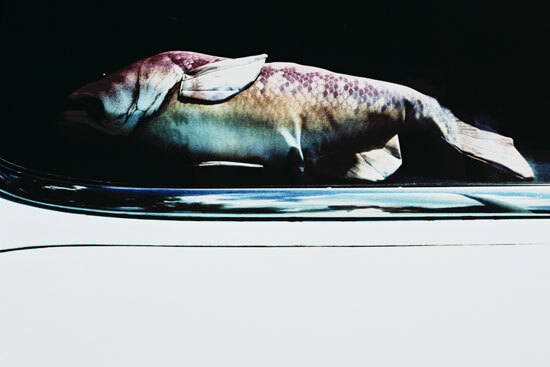 The artificial fish was the only photo I ever made in Berlin Dahlem, a couple of years ago – with a lowly film camera and some cross processed film. Back then quality control misery reared its head daily, in the lab, so I don’t look back. But more and more I wish one could make photographs without a camera at all. Previous PostPrevious American Kitchens, By Mara L.